Decorate quickly and easily with laser lights! Simply plug in, stake into the ground and go. 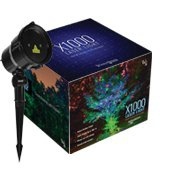 The light displays up to 300 feet allowing you to cover large spaces easily. Includes remote to set timer and turn on and off with the push of a button. Your Winter Wonderland is just a twinkling star and sparkling snowflake away! Professional quality displays in twinkling, folding, LED and rope light styles. Hang against the house and suspend from tree branches for magical Christmas nights. 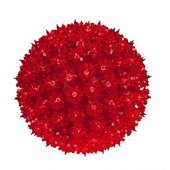 Christmas Light Balls make it easy to decorate any space. Simply unfold, plug in, and decide where to display them. Mix and match colors and sizes for unique displays. Garland lights create sophisticated holiday lighting in an effortless installation process. 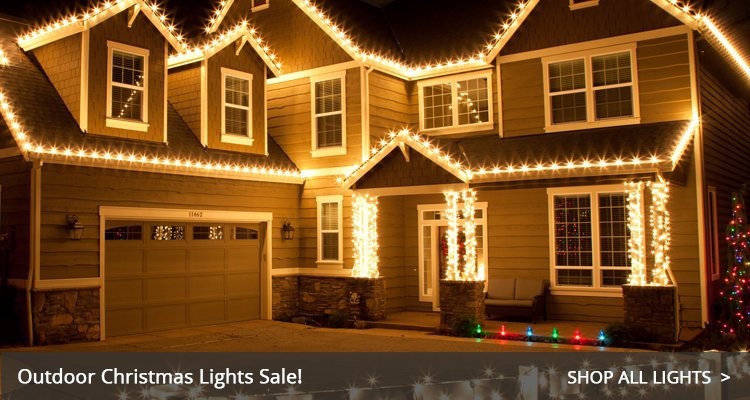 Choose from mini lights or energy efficient LEDs available in unique color and wire combinations. Use garland lights and beaded light curtains inside or outdoor to add unique style to any design theme. Mini Christmas Trees designed to add lighted foliage outdoors. 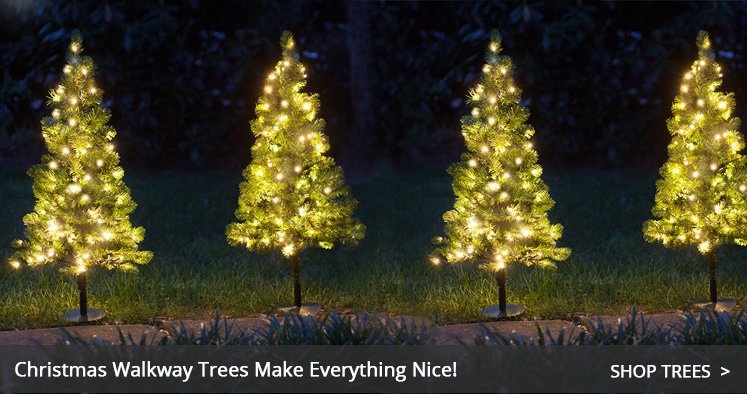 Pre-lit outdoor trees in clear, multi or LED lights. Line walkways or place into pots for holidays and weddings. Adorn your home with classic Christmas greenery! 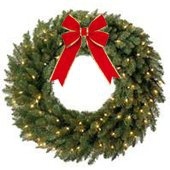 Choose from prelit, natural unlit, decorated and battery wreaths and garland. Show off elegant greenery on doors and windows, across your mantle and down a staircase for chic holiday decor! Lighted reindeer add elegance to outdoor Christmas decorations. Natural grapevine and topiary animals in LED or clear lights. Display in teams or groups for a tranquil theme. Choose red, gold or silver bows from 14 to 96 inches wide. Available in velvet, velor and nylon fabrics. 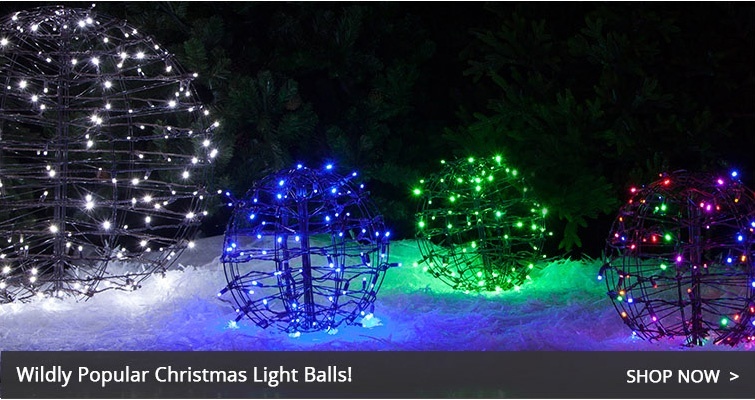 Christmas Light Balls - These amazing spheres of light were popularized by DIY'ers and now come in an innovative fold-flat design. Setup in seconds. Store easily. Snowflakes & Stars - These wildly popular Christmas decorations come in many shapes, sizes and colors. They can be hung from trees, rooflines and porches. Christmas Motifs - Unique displays designed with popular Christmas scenes that look great in the yard or on rooftops. Starlight Spheres - Iconic Christmas ball lights that look like glowing ornaments hanging from trees and roof overhangs. LED Lightshow Trees - Display beautiful outdoor Christmas tree shapes of light with mesmerizing animated patterns. Outdoor Christmas Lights - You may have missed it, but we sell a lot of lights, including LED Christmas lights or incandescent lights in all shapes and sizes. C7 & C9 Lights - Choose from the largest variety of C7-C9 bulbs, light sets or make your combination with our stringers and spools. Icicle lights - You may find a huge selection of icicle lights ranging from traditional lights to special color theme lights that look spectacular. Net Lights - Your bushes will thank you. There's nothing like draping your hedges in net lights. Walkway Christmas Trees - Pre-lit mini outdoor Christmas trees are a great addition to driveways, paths and frontdoor entrances. Outdoor Christmas Trees - Choose from a wide selection of tree shapes and styles including traditional trees, light show trees and fold-flat trees. Wreaths and Garland - Don't settle for tinsel greenery. Our high quality Christmas greenery is built to last and looks great year over year. Christmas Topiary Animals - Grapevine deer and topiary animals are a natural classic that are handmade for elegant Christmas displays. Christmas Bows - Get quality bows up to 8 foot large that look great from windows, railings, fences and hanging from greenery. "Oh my God!!!!! I love my order ...."
They're the physical representation of holiday spirit and the source of hundreds of cherished moments shared between families and loved ones. Whether it's as simple as a red bow on every window or a mega display that you can see from space, adding outdoor Christmas decorations to the exterior of your home is a beautiful way to share the spirit of Christmas with your family, friends and neighbors, and maybe even spread a little joy to complete strangers too - the power of outdoor Christmas decorations is truly remarkable. With so many options, which Christmas decorations should you choose?! It's entirely up to you! Our notes on some of the most popular outdoor Christmas decorations should help guide you through the options. With so many options, which Christmas decorations should you choose?! It's entirely up to you! Our notes on some of the most popular outdoor Christmas decorations should help guide you through the options. Outdoor Christmas Lights- available in an enormous array of colors and styles to complement any outdoor Christmas decorations! Outdoor Christmas lights include popular C7 & C9 light bulbs, icicle lights, incandescent and LED mini lights and pathway lights. The possibilities with where and how you decorate the exterior of your home with Christmas lights are truly endless. Some popular locations for decorating with outdoor Christmas lights include roofs, columns, railings, porches, walkways, trees and even the yard! C7 & C9 Christmas Lights - are the most popular and best option for creating perfect lines and contours along roofs and peaks. C7 & C9 lights can be hung from gutters or shingles with special light clips designed for roof applications. C7 lights are smaller than C9 lights and work well on most homes, especially smaller residences like townhomes and condos. Large C9 bulbs can be seen from greater distances making them the ideal choice for tall buildings and bigger light displays. Icicle Lights- like C7 & C9 bulbs, are one of the most popular outdoor Christmas light styles for lining the roof and look beautiful hanging off of porch overhangs and stair railings too! Choose from traditional icicle lights with multiple drop variations on one string, curtain lights with drops ranging from 6 feet to 50 feet and realistic cascading icicle lights with animations that mimic dripping ice! Christmas Mini Lights- the most versatile lights for outdoor Christmas decorating! There are hundreds of colors and styles of mini lights available to suit every project and match any outdoor Christmas decorations! Wrap mini lights around outdoor trees, columns and railings to add additional light to your front yard and porch. You can even weave mini lights through small bushes and shrubs to create a cheerful glow from within. Pathway Lights- include either C7 or C9 LED or incandescent bulbs and coordinating light strings with included light stakes to make lining walkways, pathways and landscapes a breeze! Christmas Light Balls - The name says it all. Light balls are sphere shaped decorations covered in lights. Christmas light balls come in several varieties including light balls that fold flat, LED mini and fairy light balls, RGB LED light balls featuring a variety of color combinations in one, and commercial grade light balls with heavy duty frames. Christmas light balls are often displayed hanging from tree branches, porches and in ceiling applications, however they can also be placed on the ground as part of a larger light display. 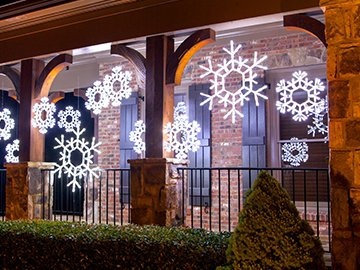 Snowflake & Star Lights - feature an incredible variety of designs and are illuminated with rope light, LED mini lights, LED strip light and even a flexible neon light. 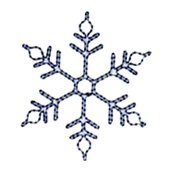 Snowflake lights are available in solid white or blue colors as well as combinations featuring blue and white lights or warm and cool white LED lights together. 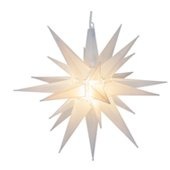 Star lights are available in a variety of styles including Moravian and Bethlehem with a wide array of popular colors. Several star lights even have color changing light options. 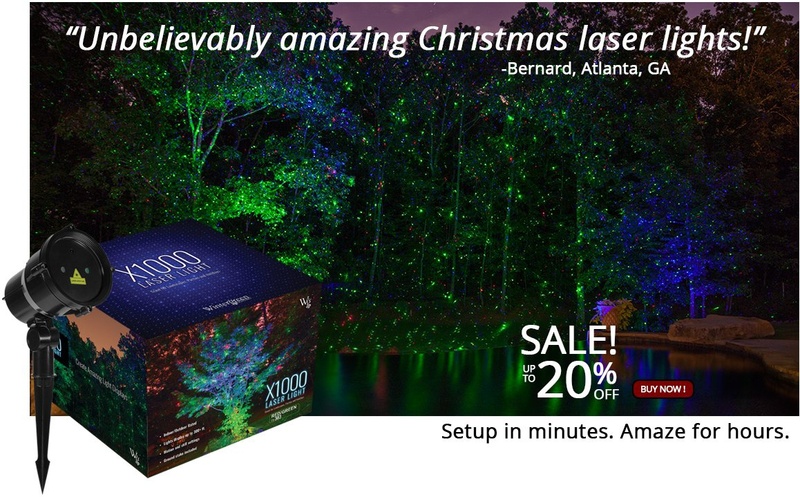 Laser Christmas Lights - might just be one of the easiest outdoor light display options you'll ever use! Just plug laser light projectors in and point them onto the front of your house, inside of an event space or against a backdrop of trees to create an illuminated environment with thousands of light points. Christmas Wreaths & Garland - are the classic holiday adornment for windows, doors, columns and railings! Christmas wreaths and garland are a popular outdoor Christmas decoration and look beautiful on their own or paired with classic red bows! Wreaths and garland are available in matching greenery families for a cohesive design as well as incandescent and LED multicolor and white Christmas light varieties. Outdoor Christmas Bows - pair perfectly with Christmas greenery but look beautiful on their own as well! Outdoor Christmas bows in red, silver and gold colors are available in sizes ranging from 12 to 72 inches. 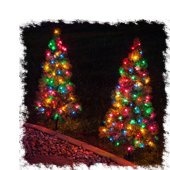 Christmas Topiaries with Lights - are a beautiful option for creating a cheerful holiday scene in your front yard. Playfully arrange a family of graceful reindeer around a decorative pond or fill santa's sleigh with presents. Garland and grapevine wrapped topiaries are lit from within using LED or incandescent mini lights. Walkway Christmas Trees - come with a small spike that can be inserted in the ground to illuminate walkways with ease! When selecting which walkway tree will be the best addition to your outdoor Christmas decorations, take into consideration the rest of your Christmas light colors and choose walkway trees with complementary lights. If your entire home is decorated in warm tones, walkway trees featuring warm white LED lights may work best, whereas cool white lighting pairs perfectly with multicolor LED walkway trees to add a pop of color. LED Light Show Trees - have a shape similar to tree cones and are pre-programmed with a series of animated light patterns. Light show trees work great for outdoor Christmas light displays and are available in sizes from 4 feet all the way to 12 feet! Christmas Motifs - popular Christmas icons, scenes and characters adorn the Christmas motif lights family. 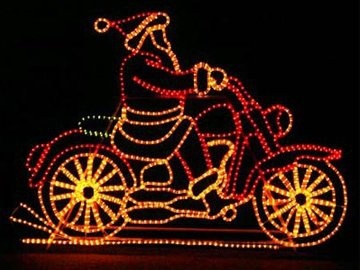 From Santa on a motorcycle to present packed trains, outdoor Christmas motif decorations are popular as stand alone display items or when used in groups to create festive scenes.